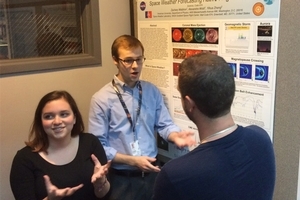 Alexandra Wold (left) and Zach Waldron (right) explain their NASA Goddard Space Flight Center space weather research. On Friday February 24 you may have noticed a few extra faces on campus. Over seventy middle school students from DC Public Schools participated in the first annual American University Optics Olympiad in the Mary Graydon Center. The Olympiad's aim is to reach traditionally underrepresented groups in the sciences at a young age and get students excited about science. Middle school students from Hardy Middle school, The Washington School for Girls, and Inspired Public Charter School, were brought to AU to learn about optics by participating in demonstrations about color perception, infrared light, waves, lenses, and lasers. Highlights included a laser maze, an infrared camera that can see through plastic, and a Ruben's tube which shows wave behavior with different sizes of flames. The Olympiad was supported by a grant from the National Science Foundation, with additional support from the College of Arts and Sciences, the AU Physics department, and the American Physical Society. After a pizza lunch, students had a question-and-answer session with professionals from the National Society of Black Physicists. Later, teams of students participated in a Jeopardy style quiz tournament based on the optics knowledge the students learned in the morning. After a hard fought battle the tournament ended with a victory for the Hardy Middle School Hawks. All of the students left the Olympiad with a goodie bag of optics toys and comics. The Optics Olympiad was run by faculty and staff in the physics department as well as student volunteers from around campus. Planning has already begun for the second annual Optics Olympiad in academic year 2017-18. If you would like to contribute in any way please contact Dr. Gregg Harry of the AU Physics Department at harry@american.edu. In addition to science outreach, AU students are also conducting physics research on and off campus. This includes students from AU's Physics Department working as space weather forecasters, defending NASA missions from the aggressions of the sun. Space weather refers to the changing conditions of the sun's activity, including billion-ton eruptions of plasma and high-speed streams of solar wind, and solar events that cause geomagnetic storms at Earth. Damaging effects include radiation for astronauts and airliners, atmospheric expansion slowing satellites, communication disruptions, and electrical surges in power grids. Space weather also causes the colorful aurora at Earth's poles. The Space Weather Research Center (SWRC) at NASA Goddard works through the Community Coordinated Modeling Center (CCMC), and NASA depends on student forecasters, including American University alum Dhanesh Krishnarao, and AU seniors Alexandra Wold and Zach Waldron, to observe and analyze the Sun's activity. Student forecasters report directly to Mission Operations if solar events have the potential to impact any of NASA's Earth or space assets. Students become certified as Independent Forecasters by attending NASA's 10-week summer internship program at Goddard Space Flight Center in Greenbelt, Maryland. The internship consists of a two-week boot camp to learn the fundamental physics that drives the space weather, and another eight weeks of real-time operations, practice, and research. During their internship, Zach and Alex won the Orbit Award for Science for presenting their research poster, Space Weather Forecasting Active Region 12371, at the GSFC Summer Intern Poster Session in July 2015. Previously, Dhanesh Krishnarao helped develop the Spacecraft Environmental Anomalies Expert System (SEAES), a system useful to NASA mission operators. Zach Waldron worked to determine the correlation between solar dimmings and coronal mass ejections. In Summer 2016, he then conducted nuclear physics research at the Institute for Nuclear Physics in Mainz, Germany, and he is now doing astrophysics research at George Washington University in a search for fast radio transients. Alex Wold returned to NASA in summer 2016 to teach the newest generation of space weather forecasters, and she was awarded the prestigious John Mather Nobel Scholarship, which funds her travel to present her research at professional conferences. She is now working at NASA to validate the real-time coronal mass ejection arrival-time predictions of the WSA-ENLIL+Cone model at the CCMC. She has presented her work across the country and abroad: at the American Geophysical Union Fall meeting in San Francisco, at European Space Weather Week in Belgium, and at the International CCMC-LWS Working Meeting in Cape Canaveral, Florida. Her abstract was recently accepted for presentation at the Japanese Geoscience Union Meeting in Chiba, Japan, where she will travel before returning to Goddard to train more space weather forecasters for a final summer. After graduating this summer, Zach will work at the National Institute for the Standards of Technology (NIST) on the remote sensing of radiation dosages, and plans to work on a Ph.D. in Physics starting Fall 2018. Alex has accepted an offer from the University of Colorado Boulder's Aerospace Engineering Sciences Ph.D. program, and will be studying Remote Sensing, Earth, and Space Sciences starting Fall 2017.